Software developers have their own preferred tools. Some use powerful editors, others Integrated Development Environments (IDEs) that are tailored for specific languages and platforms. In 2014 I created my first AWS Lambda function using the editor in the Lambda console. Now, you can choose from a rich set of tools to build and deploy serverless applications. For example, the editor in the Lambda console has been greatly enhanced last year when AWS Cloud9 was released. For .NET applications, you can use the AWS Toolkit for Visual Studio and AWS Tools for Visual Studio Team Services. 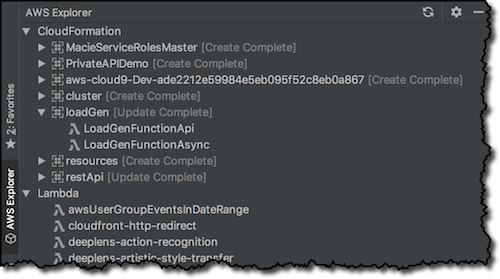 Today, we are announcing the general availability of the AWS Toolkit for PyCharm. We are also announcing the developer preview of the AWS Toolkits for IntelliJ and Visual Studio Code, which are under active development in GitHub. These open source toolkits will enable you to easily develop serverless applications, including a full create, step-through debug, and deploy experience in the IDE and language of your choice, be it Python, Java, Node.js, or .NET. Create a new, ready-to-deploy serverless application in your preferred runtime. Locally test your code with step-through debugging in a Lambda-like execution environment. Deploy your applications to the AWS region of your choice. Invoke your Lambda functions locally or remotely. 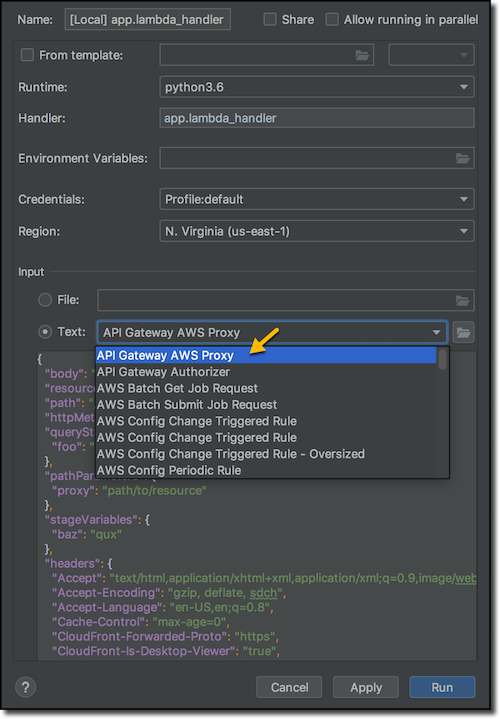 Use and customize sample payloads from different event sources such as Amazon Simple Storage Service (S3), Amazon API Gateway, and Amazon Simple Notification Service (SNS). These toolkits are distributed under the open source Apache License, Version 2.0. Some features use the AWS Serverless Application Model (SAM) CLI. You can find installation instructions for your system here. The AWS Toolkit for PyCharm is available via the IDEA Plugin Repository. To install it, in the Settings/Preferences dialog, click Plugins, search for “AWS Toolkit”, use the checkbox to enable it, and click the Install button. You will need to restart your IDE for the changes to take effect. 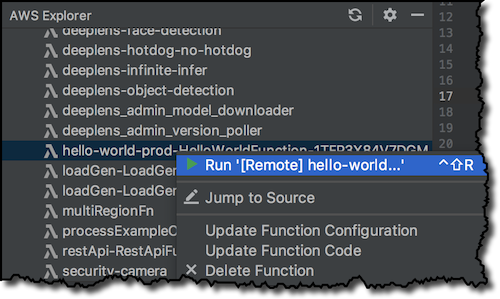 After installing AWS SAM CLI and AWS Toolkit, I create a new project in PyCharm and choose SAM on the left to create a serverless application using the AWS Serverless Application Model. I call my project hello-world in the Location field. Expanding More Settings, I choose which SAM template to use as the starting point for my project. For this walkthrough, I select the “AWS SAM Hello World”. 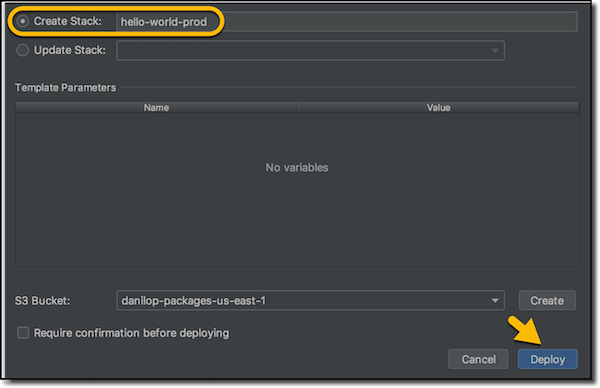 In PyCharm you can use credentials and profiles from your AWS Command Line Interface (CLI) configuration. You can change AWS region quickly if you have multiple environments. The AWS Explorer shows Lambda functions and AWS CloudFormation stacks in the selected AWS region. Starting from a CloudFormation stack, you can see which Lambda functions are part of it. The function handler is in the app.py file. After I open the file, I click on the Lambda icon on the left of the function declaration to have the option to run the function locally or start a local step-by-step debugging session. First, I run the function locally. I can configure the payload of the event that is provided in input for the local invocation, starting from the event templates provided for most services, such as the Amazon API Gateway, Amazon Simple Notification Service (SNS), Amazon Simple Queue Service (SQS), and so on. You can use a file for the payload, or select the share checkbox to make it available to other team members. The function is executed locally, but here you can choose the credentials and the region to be used if the function is calling other AWS services, such as Amazon Simple Storage Service (S3) or Amazon DynamoDB. A local container is used to emulate the Lambda execution environment. This function is implementing a basic web API, and I can check that the result is in the format expected by the API Gateway. After that, I want to get more information on what my code is doing. I set a breakpoint and start a local debugging session. I use the same input event as before. 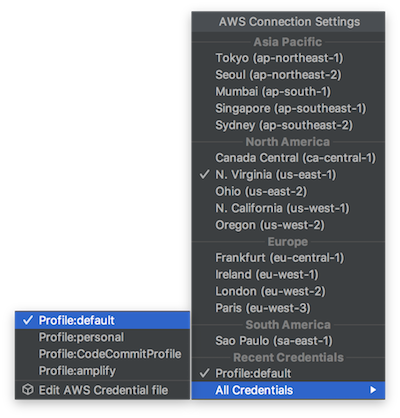 Again, you can choose the credentials and region for the AWS services used by the function. I step over the HTTP request in the code to inspect the response in the Variables tab. Here you have access to all local variables, including the event and the context provided in input to the function. After that, I resume the program to reach the end of the debugging session. Now I am confident enough to deploy the serverless application right-clicking on the project (or the SAM template file). I can create a new CloudFormation stack, or update an existing one. For now, I create a new stack called hello-world-prod. For example, you can have a stack for production, and one for testing. I select an S3 bucket in the region to store the package used for the deployment. If your template has parameters, here you can set up the values used by this deployment. After a few minutes, the stack creation is complete and I can run the function in the cloud with a right-click in the AWS Explorer. Here there is also the option to jump to the source code of the function. As expected, the result of the remote invocation is the same as the local execution. My serverless application is in production! Using these toolkits, developers can test locally to find problems before deployment, change the code of their application or the resources they need in the SAM template, and update an existing stack, quickly iterating until they reach their goal. For example, they can add an S3 bucket to store images or documents, or a DynamoDB table to store your users, or change the permissions used by their functions. I am really excited by how much faster and easier it is to build your ideas on AWS. Now you can use your preferred environment to accelerate even further. I look forward to seeing what you will do with these new tools! Danilo works with startups and companies of any size to support their innovation. 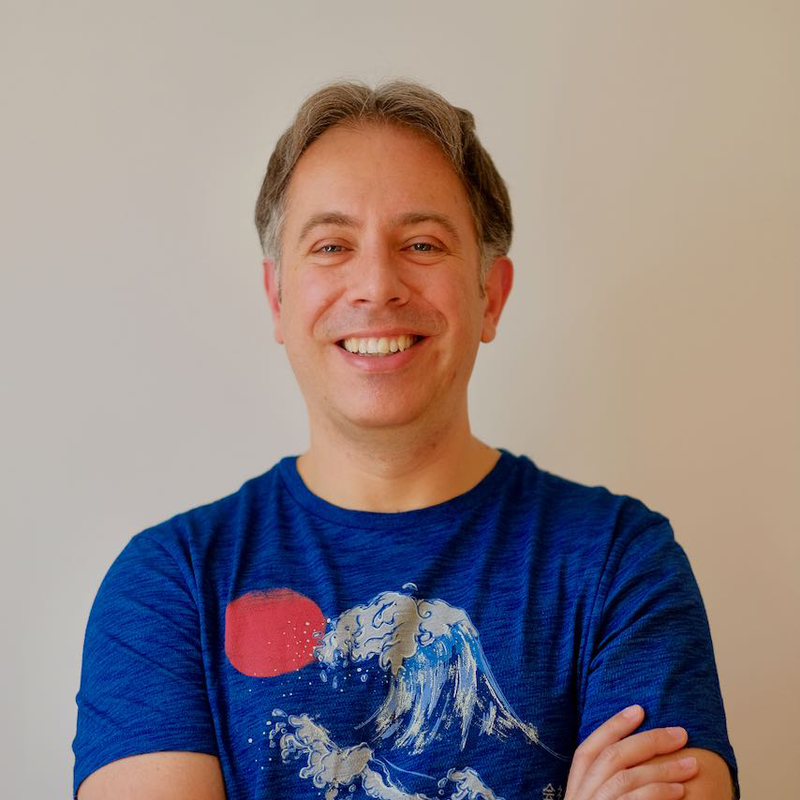 In his role as Evangelist at Amazon Web Services, he leverages his experience to help people bring their ideas to life, focusing on serverless architectures and event-driven programming, and on the technical and business impact of machine learning and edge computing. He is the author of AWS Lambda in Action from Manning.